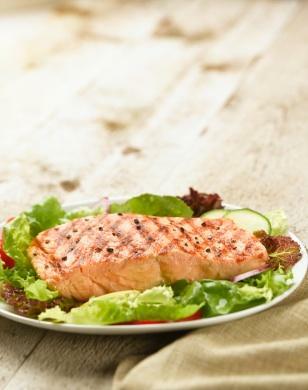 You are not alone if you have asked yourself countless times, "how do I grill salmon"? It is understandable to have some trepidation about cooking this tasty fish. Too much heat renders it dry, tough and unappealing. Too little cooking and all you have is raw fish. There is a distinct balance that can be achieved through the proper marinating techniques and grilling temperature and time. The wonderful thing about salmon is that because of its high (good for you) fat content it stands up better to grilling than most other fish. The key to maintaining a fresh, fat, juicy fillet or steak is choosing the right thickness, keeping the skin on, and ensuring that the grill is at the right temperature. Choose fillets or steaks about one-inch thick. Leave skin on to protect the flesh from drying out. Bring the fish to room temperature. Blot the excess moisture from each piece with a paper towel and then season with your choice of herbs, spices, pepper, citrus zest, or garlic (the sky is the limit). See below for some great herb and spice pairings. Do not salt the fish prior to grilling as it will draw out moisture. If you choose a marinade, don't allow the fish to marinate for more than 15 minutes or the acid in the sauce will cook the flesh and make the pieces mushy. Preheat your grill to medium-high and lightly oil the grill rack. To determine a medium-high heat, hold your hand about four inches from the grill and start counting. It is ready if you can only hold your hand over the grill for four to five seconds before it is too hot. If you have to move your hand within two or three seconds, it is too hot. If you can hold it for more than five seconds, the grill isn't hot enough. Place the salmon skin-side down on the grill. If you are using salmon steaks, don't worry about which side you grill first. Cook the fish on medium-high for about 4 minutes on each side, or until opaque. If you are using a marinade brush the filet or steak with the extra juices at least once during cooking. Following these steps, you don't have to wonder, "how do I grill salmon?". You can start teaching your friends or surprising your guests. Although grilling salmon seems fairly straightforward, there are a few important considerations to keep in mind when grilling this particular piece of fish. Start grilling skin-side down and don't move the piece of fish until the skin removes easily from the grill. Oil both the grill and the salmon to ensure that the fish doesn't stick. Instead of grilling directly on the slats, consider wrapping the fish in large rectangles of aluminum foil and center a filet or steak in each one. Once you have seasoned with your preferred herbs and spices, fold foil tightly and grill packets for 10 minutes over medium-high heat until desired doneness. For a gas grill, heat to about 325 degrees to 350 degrees F. Make certain to properly prepare the grill by scrubbing the grill with a stiff wire brush to remove any residue that will make the salmon stick. After placing the fillets on the grill, turn it down to low heat to better monitor the cooking.